The Bambuser Dashboard is the online platform where you can manage a Bambuser account, team, groups, users and content. When signing up for a Bambuser account a Bambuser team is created . The user signing up is automatically promoted as the team admin. A team may consist of several groups and users with different roles. The team admin may follow up on some statistics to see how the team is performing. You find your team account’s statistics in the dropdown with your name in the top right corner. The displayed stats are grouped based on currently selected environment. 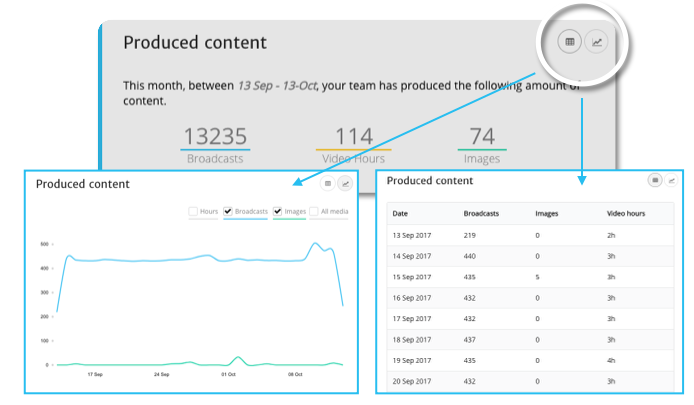 Here you will find the total number of broadcasts made, video hours recorded and images uploaded for the selected period of time. Shows how much data was transferred to your viewers. You can also see the transfer on a daily basis. Here you will find how much storage you archived content occupied at most for the selected period of time. You can also see with how much it has changed on a daily basis. The number of views reflects the number of times someone has started a broadcast. It does not mean the viewer watched the whole broadcast or that it has to be a unique viewer. Viewing hours tell you how much time was actually spent watching your videos. The activity stream shows your team’s recent activities. With a big team it might be handy to place users in different groups. Team admins have the permission to administrate groups but moderators may regroup users within them. Only empty groups may be removed. To remove a group including users make sure to move them first by changing group belonging. When the group is empty make sure to select it and click the “garbage bin” icon. To change the name of a group, simply select it, click on the current name, type in your new name and press Enter. You are allowed to change a group name if you see the “pencil” icon in the upper right corner next to the current name. Admins and moderators may utilise group tags to make sure videos produced by its users are automatically tagged. Group tags might come in handy to find the content you are looking for easier. 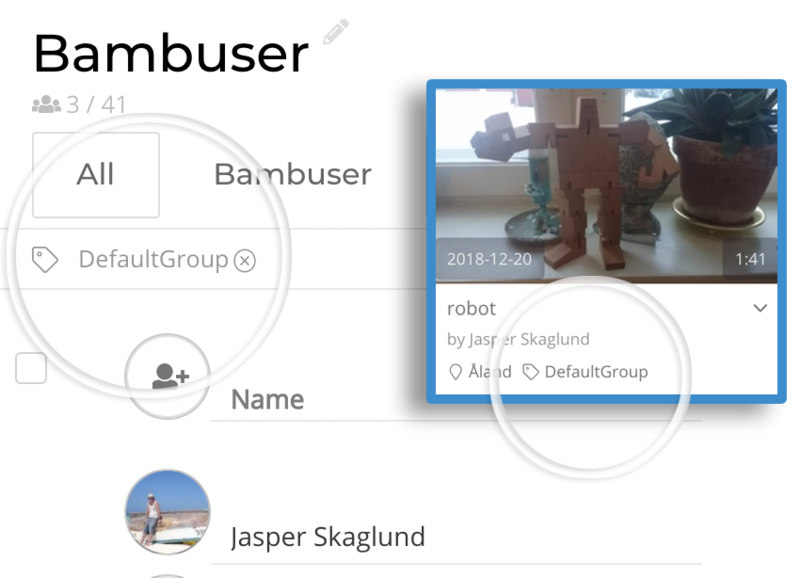 A Bambuser user is anyone with a Bambuser account. An account may originate by a user signing up to Bambuser or by being invited to a team by another user. A user can always access the Bambuser Dashboard and use the Bambuser broadcasting App. A user can be promoted and demoted at any time. The allowed levels depend on the editing user’s role. A moderator may not demote an admin and can not add users with higher level than a moderator. An email is sent to the user including a link to change the randomly generated password. If you want to remove several users at the same time. Mark the checkbox next to each user you want to remove, click the “Remove” button appearing at the table header and confirm the action. Tip! You can mark/unmark all users at once by using the checkbox placed in the table header. You can update your profile or ask a Moderator or Admin to help you. If you have access to the Bambuser Team you can edit users inline by hovering the user you want to edit and click the “pencil” icon. Update the values which need to be altered and click on the green check button. All Bambuser users have a password to be used for logging in on either the Bambuser broadcaster app or the Bambuser dashboard. To change the password, go to your profile page , click on “Change Password”, enter a new password which is at least 5 characters long and press Enter or click “Save”. If you want to see the password you typed simply click “Show”. To change your username go to your profile, click on the current username, change it and press Enter. If you can see the small “pencil” icon in the upper right corner you are allowed to alter the value. To change a user’s group on a profile page simply click on the current group to open the dropdown and select the new group. If you can see the small “chevron” icon next to the group name you are allowed to alter the value. To change a user’s role on a profile page simply click on the current role to open the dropdown and select the new role. If you can see the small “chevron” icon next to the current role you are allowed to alter the value. Currently it is not possible to change a user email as the mail is used to identify a Bambuser user. If you have a big team with many users you can search for a specific user by typing either name, email or part thereof in the search field. Select the applicable group if known, or simply choose “All”. Bambuser is made by developers for developers which is why we strive to make integration of live video to your own project as simple as possible. We aim to get you started quickly by showing you different ways to start a live broadcast, watch it and integrate it to your own project using our APIs. On our developer page you find all the tools you need to build your own live streaming app etc. To make it easier to separate your publicly available project with your tests we provide you with two environments, Production and Sandbox. To switch between the environments simply select the one to use in the dropdown in the navigation bar. We suggest that when starting a trial and for your first implementation of a project you initially use applicationIds and API keys etc. for your Sandbox environment. When you are ready for launch you change them for new ids and keys produced in the Production environment.